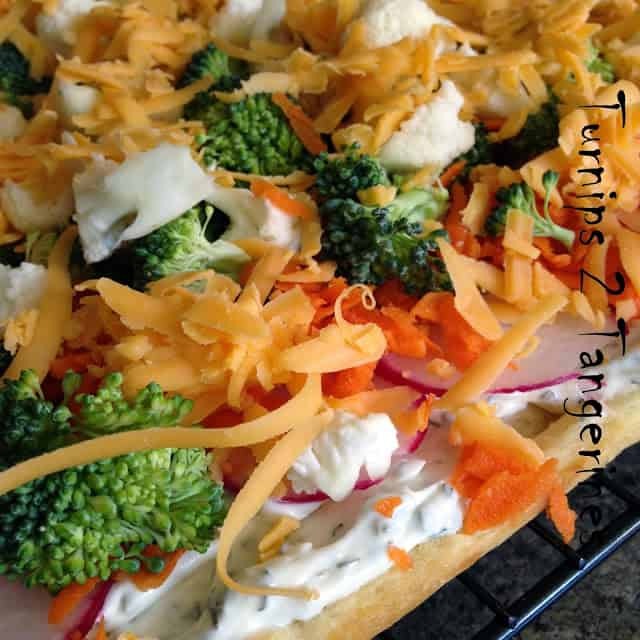 Awesome Vegetable Pizza makes a great appetizer but I like to serve veggie pizza for dinner. On a hot summer evening, when I would rather not heat up my kitchen or eat another grilled burger or grilled chicken breast, I make this recipe for veggie pizza. The crust only has to bake for 8 minutes so it doesn’t heat up your kitchen. The result is a delicious, refreshing and satisfying veggie pizza. Perfect for eating outside at the picnic table. 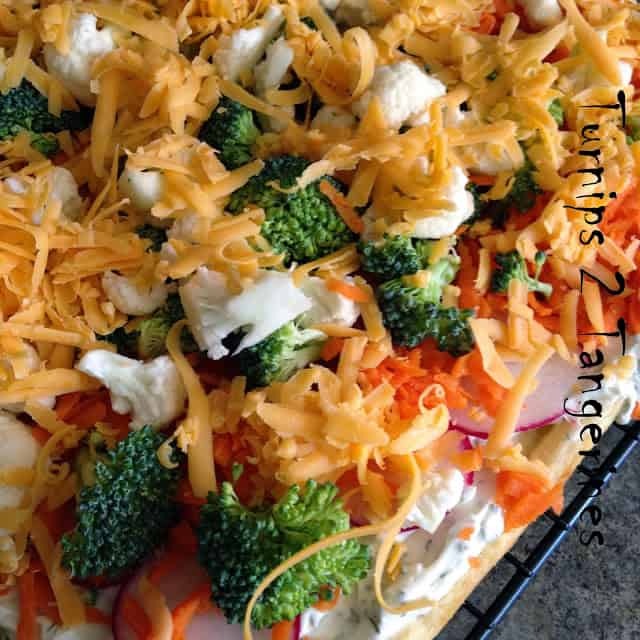 Awesome Vegetable Pizza is delicious for lunch, dinner or snack time! Unroll both cans of dough, press in the bottom and up sides of jelly roll size baking sheet, sealing or pressing together perforated edges. Bake at 375º for 8 minutes, watching carefully until browned. Cool crust completely. Layer radish and cucumber slices on top of dip. Sprinkle shredded carrots over radishes and cucumbers. Press down lightly with fingers. Sprinkle with onions and green pepper. Press down lightly. Sprinkle with broccoli and cauliflower florets. Press down lightly with fingers. Sprinkle with shredded cheese. Press down lightly. Cover loosely with saran wrap. Chill in refrigerator about an hour. When ready to serve, cut veggie pizza with a pizza cutter. 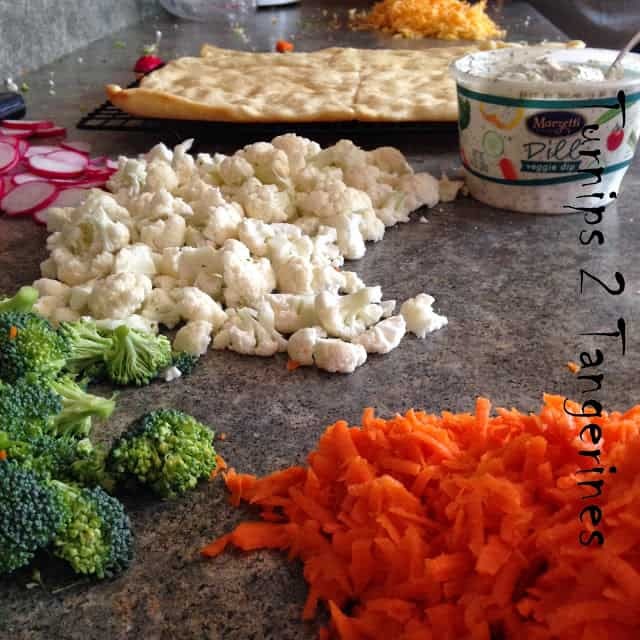 For this recipe we used Pillsbury Crescent Rolls and Marzetti Dip. Serve Awesome Vegetable Pizza with Mini Cheesy Dogs, for a fast and yummy lunch. If you haven’t tried mincemeat in some time, now’s your chance. Give this recipe for Pumpkin Mincemeat Bars a try and rediscover mincemeat. Today’s mincemeat made by Nonesuch is made with apples, raisins and dates. We loved this recipe Lynn! The Hubs exact words as he was eating it – "This is Awesome!!" Thanks for sharing such a great recipe! I loved getting paired with you this month for SRC!! 🙂 Happy Reveal Day! Yum, I love veggie pizza! This looks delicious. Thanks so much for sharing at the Foodie Friends Friday link party this week!